Very apropos for this week, the Mommy Cubed Blog Hop theme of the month is Birthday Parties. This week is all about planning for Gabbie’s 8th birthday party coming up on Sunday! This is the second year we’re doing a very small party with only her very best (girl) friends. We decided to do an art party. Although the last two years have also focused around doing art projects, this year is specifically an art theme, and we’re also using a rainbow theme. Pinterest, of course, has been awesome for finding and saving ideas for the party, some of which I’ve just found recently – others I’ve been saving all year. First up – invitations! 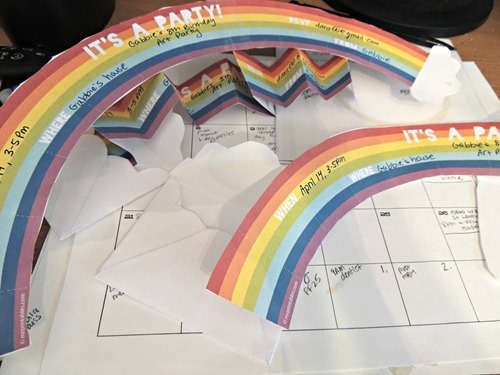 I found this awesome rainbow printable – click the link for the source – and with only 4 invitations to make, it was completely doable! They fold up into this little envelope. I need to buy: palettes, paint, brushes, canvas, easels…and possible something else to paint like wooden boxes or figures. I am thinking of having another activity aside from painting as well. I really like this idea: I am just not sure about the baking idea. If I could figure out a way to attach the rows to each other without melting the beads, I would totally use this idea. Or…maybe I shouldn’t be so worried about baking plastic beads? Well, my friend and I are making it. I am not a great baker and she has already made the cake once so she will help me! I will let you know how it turns out. I might just do it! 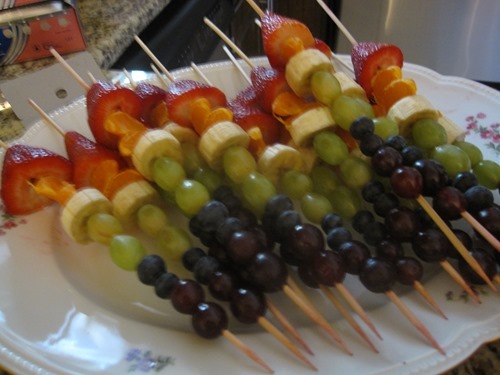 I’m thinking Twizzler pieces, baby carrots, pineapple, green grapes, blueberries, and purple grapes. Funnily enough, last year we did this: Which totally would work this year too! I like the way the other set up looks though! Decorations? Well, I don’t really want to buy 7 rolls of crepe paper, so I guess I’ll see what I see at the store! I’ll certainly share the results and the party itself after it happens! Don’t forget to visit Mommy Cubed for the blog hop and Mommy Blog Hoppers for some great Mommy posts! My most recent post there was about music!